The shield was an important aspect of Greek warfare, and as such, every Greek warrior, called a hoplite, traditionally carried one. 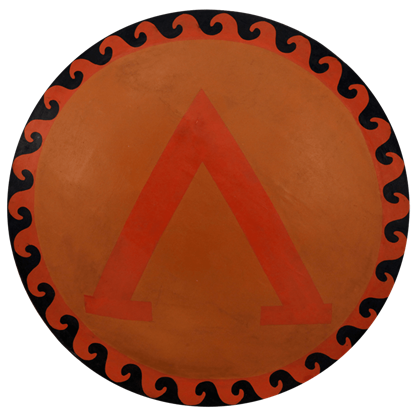 Traditionally Greek shields were wooden shields, although at Medieval Armour, we also offer a number of Greek steel shields, which allows any ancient warrior enthusiast to choose between a variety of materials and designs. 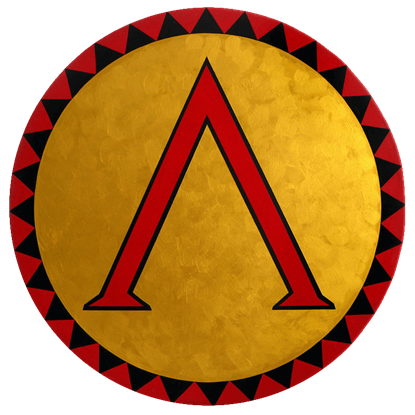 Perhaps the most iconic Greek shield is the lambda shield, which features the Greek letter lambda on its surface. 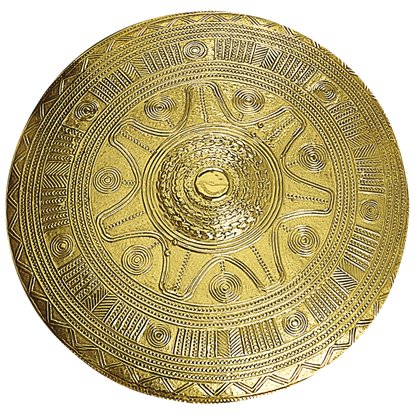 More than just a Greek shield, this design was traditionally that of a Spartan shield. 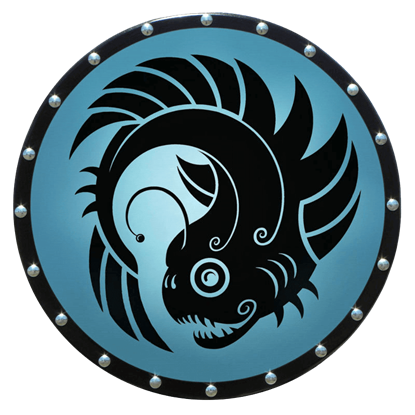 Of course, we don't only offer Spartan shields, but also Trojan shields and traditional hoplite shields that feature a huge assortment of incredible designs, ranging from Greek symbols of myth to fearsome animals, all designed to make a shield more personal and more intimidating. And make no mistake, our wooden Greek shields are every bit as strong as a traditional steel shield. 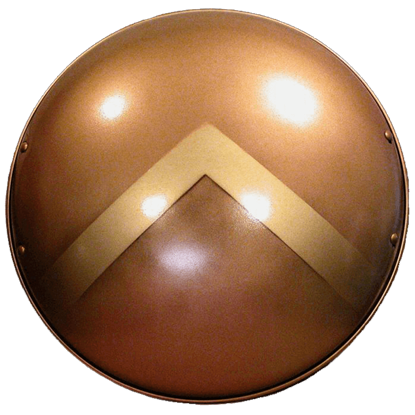 Many, in fact, are fully functional, battle ready shields that are designed to take a blow and allow a warrior to push back and shrug it off. That means that these functional Greek shields are perfect as reenactment shields, or as SCA shields if you find a chapter that Greek reenactments and Greek fights. And even if you're not fighting with it, many of these Greek shields are fantastic display pieces that look great when mounted on a wall or even displayed on a (large) shelf. Take a step back in time and pick up one of these Greek shields, and you'll fall in love not just with the weight, the heft, and the strength of the shield, but also the designs featured on every one of the Greek shields found here at Medieval Armour. Modeled after a ceremonial shield that was dated back to 7th century B.C., the Brass Villanovan Shield is a beautiful recreation of an antique shield that features an immense array of attractive and impressive embossed designs. 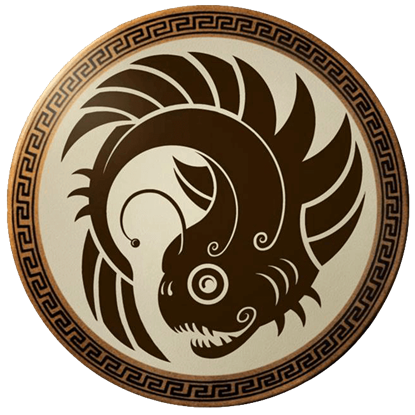 Rendered in an attractive bronze, the Round Greek Lantern Fish Wooden Shield features Greek styling and a depiction of the deep sea lantern fish. This shield is made from strong composite wood and hand-painted with artist-grade paint. Rendered in a sea blue hue, this Round Greek Lantern Fish Wooden Shield features Greek styling and a depiction of the deep sea lantern fish. This shield is made from strong composite wood and hand-painted with artist-grade paint. 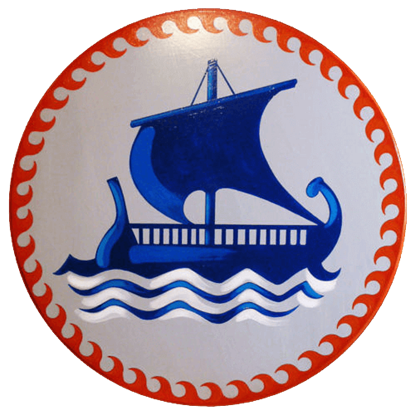 The Round Greek Sailing Ship Wooden Shield is a beautiful hand-made, hand-painted round shield that depicts a Greek ship known as a trireme. The design is based on Ancient Greek artwork that was once used on pottery and shields. The Round Wooden Greek Lambda Shield is a classical representation of an ancient Greek shield. Featuring the Greek letter Lambda, this shield is a quality, hand-made item that is both attractive and fully functional. This custom Greek shield is made of thick dished steel with a rolled edge. It is concave or domed in the traditional Greek hoplite style. 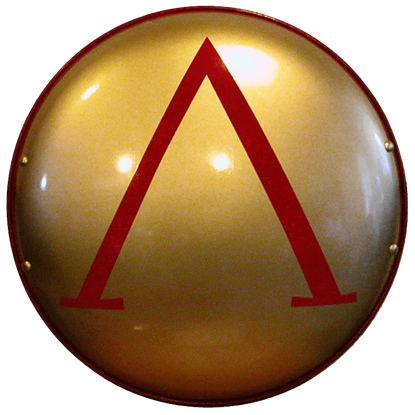 The Steel Greek 300 Spartan Shield features the Lambda design of Sparta in metallic gold. 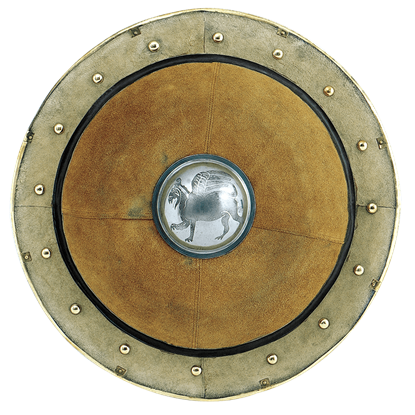 A Greek Hoplite could not ask for a better shield than the Steel Greek Bull Shield. This shield is a faithful reproduction of a Greek-styled shield made from quality materials and features several intriguing and useful features. 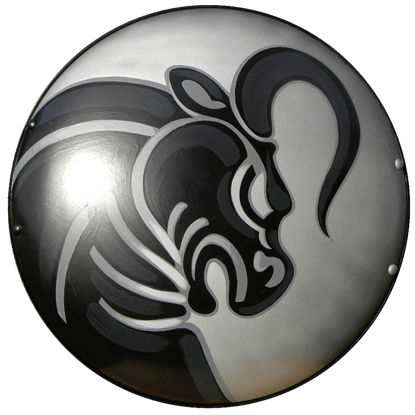 The Steel Greek Bull Shield is a beautiful concave or dome shaped shield like the traditional Greek hoplite shields of old. 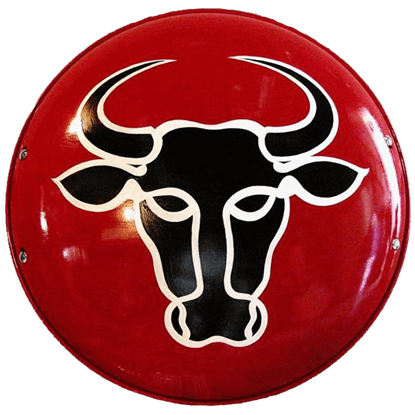 The shield bears a classic Greek Bull design, a symbol of strength and valor. 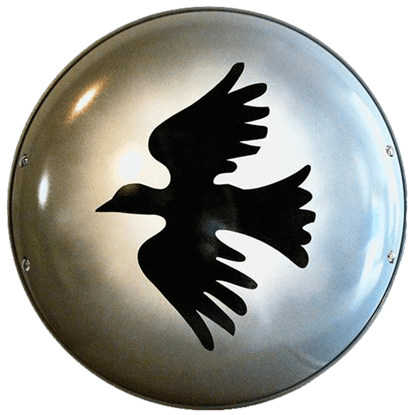 The Steel Greek Corinthian Dove Shield is a beautiful concave or dome-shaped shield like the traditional Greek hoplite shields of old. The shield features a classic Corinthian Dove design, a symbol used on many Greek shields.